Now that the top and bottom spar caps were complete, it was time to move on to step 8 of Chapter 14. This involves installing the 4 spruce wood blocks (they will later let me bolt the engine mount extrusions to the spar) and then do layup #6 - which is the outside layup (top, bottom and aft faces of the spar box). The original plans has us use 3 plies of BID for this layup; however, following CP#25, LPC #26 says we can substitute these 3 BID plies with 4 plies of UNI (alternating at +/- 45 degrees). Oooooo that is looking gooooood! Notice how I also sanded the foam shelf flush with the cap. This was much smoother and straighter than if I would have done it with a hard sanding block as the plans indicate. Also notice how I didn't mill out the forward most lip (i.e., I did not remove any part of CS4) as the sketch in CP#42 indicates. I then used my dremel to remove the remaining foam - without damaging the fiberglass underneath. Oooooo... that is nice looking pocket! I used a little bit of sand paper to make sure I was going to bond directly with the fiberglass below. I then trimmed my spruce pegs to fit inside the pockets. Each one was 'custom' trimmed to fit lengthwise - so I labeled them to know which one had to be installed in what pocket. I then outlined the side edges so that I could trim them down with the band saw.. Took me 2 seconds to trim the tip with the band saw... I then sanded them smooth... leaving them slightly taller than they needed to be so that I could sand them flush with the foam post-cure. Notice how I also rounded the bottom edges all around. This was so that the bottom surface would mate with the fiberglass below.. I didn't want the edges to prevent me from installing them all the way down.. Since layup #6 overhangs the sides, I had to build a stand to prop the spar box a few inches off the table. I screwed the 2x4 to the fwd face of the spar box - making sure to only screw into the area that will later be cut off for the baggage hole compartment. Ok.. almost there... just have to cut some UNI.. a lot of UNI. To get 1 ply at 45 degrees, I needed about 3 sections per ply to cover the whole length of the spar box. Since there are 4 plies, this required 12 pieces of UNI.. about 27" wide each (perpendicular to the 45 degree edge). 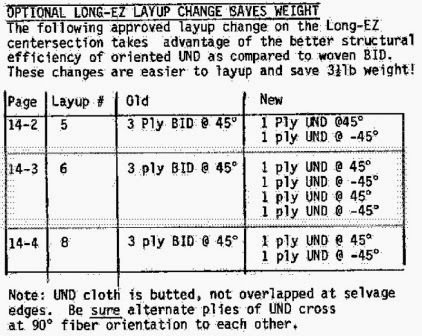 I should note that for this layup, I adopted the optional LPC #26 (found on CP #25) which states: "To save work and weight substitute UND for BID as shown on page 4 [on CP#25]." The outside layup is layup #6 in the table below. If you are wondering why I adopted it here, but not for layup #5 - I leaned toward the conservative side (for layup #5, 3 plies of BID is stronger than 2 plies of UNI; for layup #6, 4 plies of UNI is stronger than 3 plies of BID) - yes, this adds a bit of weight but for a good cause in my opinion. Well.. here we go.. covered all glass surfaces with plain epoxy (a liberal amount).. then slurried all foam surfaces and then finally covered all foam voids with dry micro. The slurry part was a bit difficult - but using a brush, it went on pretty smoothly. Here is my Elle helping me with the layup.. it's also a good shot of my time-lapse camera - how else do you think I come up with those videos?! And of course, my buddy Adam. He's been getting more involved with the project.. I think I asked him if the epoxy fumes were too strong right before I took this picture. The process went something like this: placing the cloth into position... trimming the side skirts to a 1" overhang.. wetting the aft face out (since it's flat and simple)... then using a brush, one person would apply the epoxy to the sides (the top and bottom faces of the spar box) and another person would use a squeegee card to distribute the epoxy evenly and make sure everything wetted out properly. I should also note that I marked the centerline of all the cloth pieces prior to starting the layup with dashed lines. This made placing the cloth into position pretty easy.. The plans say to go ahead and install LWA2 and LWA3.. but I decided to peel ply these areas and do them later. I also peel plied the areas where the UNI sections butted up against each other so that the outside layup would have a nice smooth transition. Another shot showing how I peel plied where the LWA3 puck will be installed later. Here is the part where Elle tells me, "Stop touching it or you will ruin it!! It's fine! Let it cure in peace!" Next up will be trimming the overhangs, installing LWA2/LWA3 and moving on to step 9! Looks very good... How long did it take you from looking at the plans to get to this stage? And then, what type of builder are you? PPL first and then started building or building first and then the license? I started reading the plans October of 2010. My first layup (practice chapter) was January of 2013. I have my instrument and commercial pilot ratings. Although I have to be honest, it is getting more and more difficult to keep current with flying. 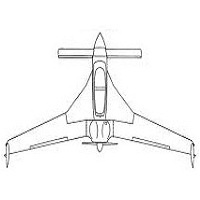 It's a constant battle to decide what to spend time and money on - flying at my local club or invested into this airplane build.